So i got the chance to go to Digital Summit this year in Charlotte, North Carolina. A plug for Straight North, it was one of my last weeks there and I fortunately got to attend with them. I didn’t really have many expectations at first. I’ve been to quite a few search marketing / internet marketing conference in my day and it can be underwhelming. Typically it’s due to a lot of surface level information that caters to more of the general marketer or the guy off the street trying to understand what they need to do next. I was impressed! The event itself was really only 1.5 days unless you had the pre-conference passes. It felt short to me. That’s mostly because all the sessions were very good and it really breezed by quickly. 2 of my favorite speakers was Jeremy vest from VidPow and Arnie Kuenn from Vertical Measures. They were extremely insightful and in-depth, helping even the technical marketer that’s been around the block a few times. Thumbnails are extremely important. They’ve done quite a bit of A/B testing, but catchy colors and eye contact are huge wins. You would think eye contact from the video to the viewer is huge, but something you sometimes just don’t think about specifically.With the thumbnails, he showed an example of a list of thumbnails. They all look blurred together mostly with the exception of the one that was different. Vibrant!, Unique! I also learned that one of YouTube’s metrics for video performance is based on the rate at which users click off the page. Meaning, if you embed links into the description portion of your video page and that user lands on the video page, and then clicks out. Your bounce rate would indicate a lower performing video. This goes against the grain of SEO’s, but all depending on your objective, this is something to consider. Not putting links into video descriptions if your concerned more about video performance within the video serps and less about SEO. The first one is simple. To Simple! It’s the use of Google’s Suggest tool for topic generation. Now i have always knows about this and actually use it from time to time. The big takeaway here is that Arnie run’s a 50+ person business around content and this is basically the Only tool he uses. Per his words! I was shocked by this. It tells me that sometimes us online marketers can over analyze things to the point of locking up. Let’s test out these 50 different tools on topic generation and spend hours trying to create that most perfect topic. At the end of the day, use the tools that are right in front of us and work. Arnie confirmed this! He also went into great depth about content gaps. All online marketers try to find topics that users search for and just haven’t been covered yet. Basically, you want to approach this as though your solving problems. Things like addressing cost concerns, problems, product or service comparisons and on and on. Users typically always have some form of thought or concern around these things. Answer that for them. Help them! I could write about many of the different speakers and the knowledge gained. 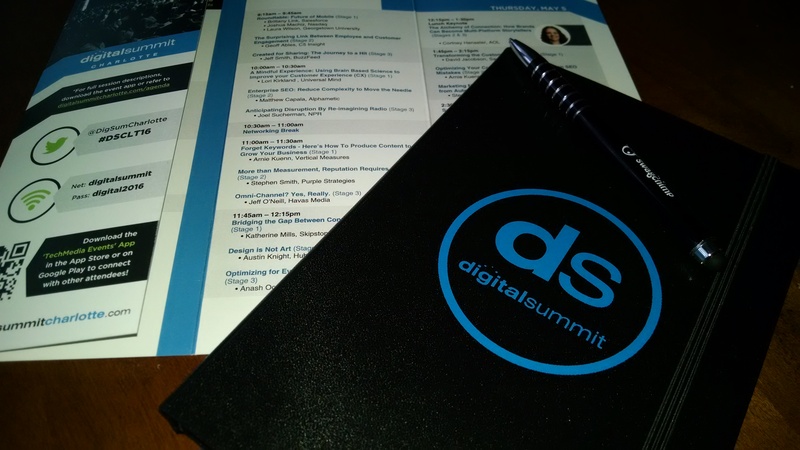 Overall I was extremely impressed with Digital Summit Charlotte. I will definitely be attending again next year and hope this conference continues to grow and pull in excellent talent. It benefits the entire industry and sharpens our skills.